After years of waiting, the world has the latest Zelda treasure that Nintendo promised: The Legend of Zelda: Breath of the Wild, with a new console—the Switch—to boot. 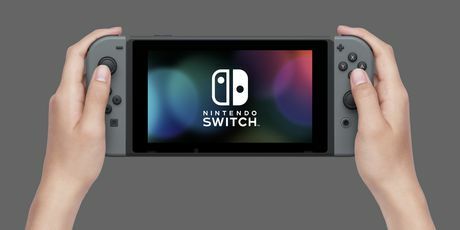 There’s broad agreement among fans and critics alike that Nintendo did what they set out to do with Breath of the Wild: more than ever before, they succeeded in creating what Shigeru Miyamoto famously called “a miniature garden that you can put into a drawer and revisit any time you like.” Indeed, many players who bought Breath of the Wild immediately upon its release three months ago (myself included) are still returning to it and discovering new features of the world. Today, Breath of the Wild meets With a Terrible Fate. 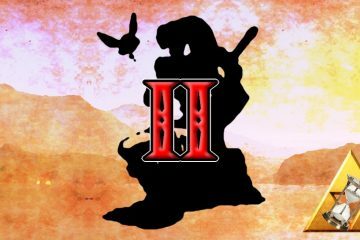 This article isn’t a review of the game, although its analysis is my best attempt at adjudicating and explaining my many, widely varied feelings about the game. And I think that this sort of response to the game is natural. After all, Nintendo broke from the recent Zelda formula in many ways for Breath of the Wild: they added voice acting; they created a massively open world; they invented a hybrid console to support the game; they told a huge amount of the game’s story through cinematic flashbacks (well, maybe they were flashbacks—but more on that later). Players of the game have a lot to process, and I think it will take a long time before we’ve really wrapped our head around Breath of the Wild. I think that Breath of the Wild represents a new, philosophically challenging synthesis of (1) game console, (2) open-world storytelling, and (3) Zelda theming. In this article, I’m going to present an analysis of Breath of the Wild that will hopefully go some distance in both explaining why some people love the game and why some people don’t love the game. Put briefly, I want to convince you that the game is lying to you about something: the Shrine of Resurrection doesn’t really “resurrect” people in the way the player is led to believe. Figuring out exactly what the player’s avatar is, then, will allow us to understand both the story of Breath of the Wild and the player’s relation to that story in a new way. Be warned of Zelda spoilers throughout. I want to begin by motivating my analyses with the two puzzles in Breath of the Wild that got me thinking about the problem of Link’s identity: fast travel and the Sheikah Slate. Once we get these puzzles on the table, we will be poised to explain exactly how the avatar and the player are connected to one another. This is what it looks like when Link “fast-travels” in Breath of the Wild—that is, when he teleports from one location on the map to another instantaneously. Such a mechanic, of course, is crucial for a game with a world as massive as Breath of the Wild’s. 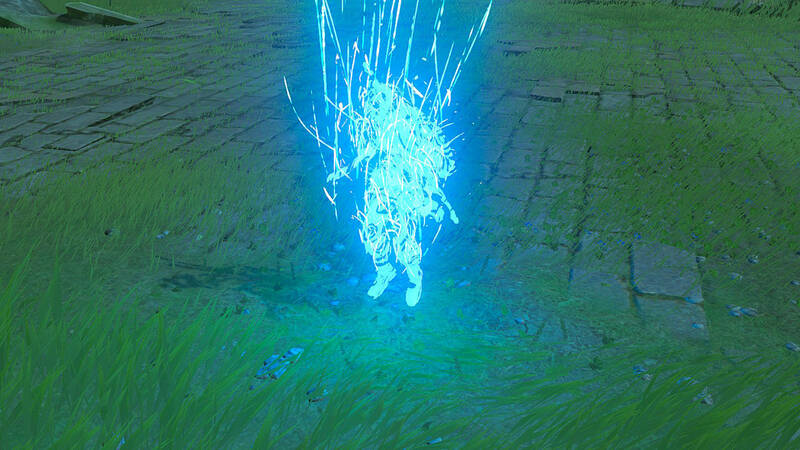 When the player decides to make Link fast-travel, he is decomposed into a stream of blue particles, which evaporates and then reconstitutes him at his destination. Of course, this is hardly the first time that a Zelda game has featured a method of fast travel: Farore’s Wind is a spell that lets Link teleport within dungeons in Ocarina of Time; the “Song of Soaring” lets Link travel from one Owl Statue to another in Majora’s Mask; Midna can transport Wolf Link in between Twilight Portals in Twilight Princess; and so on. What’s interesting, though, is that Zelda as a series has always been adept at integrating fast travel into the overall logic of the games’ worlds and stories. Farore’s Wind can presumably teleport Link by harnessing the goddess Farore’s dominion over living beings, since she created them at the beginning of the world; the power of the “Song of Soaring” derives from Kaepora Gaebora’s metaphysically external position relative to Termina, as I discussed in my work on Majora’s Mask; and Link’s wolf form renders him a creature of the Twilight Realm, which presumably grants Midna, as the Twilight Princess, the ability to move him through the twilight at will. Zelda isn’t one for deus ex machina fast travel, where the player decides to have his avatar fast-travel thousands of miles and this simply happens without any available explanation within the story. With this background, it makes sense to ask what explanation there is for Link’s ability to fast-travel in Breath of the Wild. The game doesn’t give us much explicit information to go on here. We know that it’s facilitated by ancient Sheikah technology, since (1) fast travel decomposes Link into strands of the same blue energy/material that appears in active Sheikah technology, (2) fast travel is activated as the same time that Link activates the Sheikah network of towers across Hyrule, and (3) Link can only fast-travel to conduits of Sheikah technology—Towers, Shrines, Divine Beasts, and laboratories. But this information doesn’t answer our question. After all, how can Sheikah technology decompose and then reconstitute a living being? This isn’t supposed to be a divine power like Farore’s Wind: it’s emphasized in this game more than ever before that the Sheikah developed technology, not magic. And there’s no talk of any universal, Lifestream-like, organic energy that Sheikah technology could harness to move a human being from one place to another. And it’s not as simple as the Sheikah Slate somehow facilitating faster-than-light travel: fast-travel only operates on Link and his equipment; other beings—e.g., Link’s horses—can’t be teleported, either along with Link or on their own. So here we have the first of our two puzzles: Sheikah technology facilitates fast travel, but it’s not clear how it does so. The Sheikah Slate acts as Link’s most immediate and direct access to Sheikah technology, and it’s through this piece of technology that Link is able to fast travel. So it makes sense to seek out an explanation of fast-travel in an analysis of precisely what the Sheikah Slate is. But here, again, the game doesn’t offer much by way of an explicit explanation. Zelda’s research notes on the Slate just discuss its ability to function as a camera; beyond these notes, all we really have to go on are the Slate’s various other functions: it can activate shrines, acquire regional data from Sheikah towers, and enable the various capabilities of runes. Because Link finds it in the Shrine of Resurrection when he wakes up there at the beginning of the game, it presumably also has something to do with the functions of that special Shrine—but that relationship is far from obvious (we’ll return to it later). There’s another aspect of mystery surrounding the Sheikah Slate: it looks just like the player’s controller—either the gamepad of the Wii U, or the Switch in its handheld configuration (this analysis will presume use of the Switch rather than the Wii U, however). Of course, this fact isn’t inherently mysterious: Nintendo obviously drew the connection between the fictional and real technologies intentionally. Nor is this the first time that they’ve combined their hardware with the stories of the Zelda series in novel ways—in fact, it’s become the norm for them to do this. Phantom Hourglass takes advantage of the 3DS’s stylus by making the player use the stylus to move Link; Skyward Sword effectively turns the Wii’s controller, the motion-controlled Wiimote, into a “sword” that directs the motion of Link’s sword in the game. The mystery here instead comes from the potential for the relationship between Sheikah Slate and game controller to play an important part in the fictional relationship between Link and the player of Breath of the Wild. Regulars to With a Terrible Fate know how heavily I emphasize the relationship between player and avatar as a central feature of video-game storytelling: I argued extensively that you can’t hope to understand Majora’s Mask without understanding the role of the player in its story, and I more recently developed a theory of video games according to which the player of a video game always plays a foundational, metaphysical role in that game’s story—a role that is different in kind from the role of the avatar within that story. Since the player can be involved in video-game stories and related to avatars in a multitude of complex and narratively important ways, it’s natural to ask whether the apparent similarity between the player’s physical controller and the avatar’s main means of navigating the game’s world has any deep meaning within the game’s story. So, in trying to solve our first puzzle about the nature of fast-travel, we’ve arrived at a second puzzle: what exactly is the Sheikah Slate, and does it have any narratively significant bearing on the relationship between Link and the player? And now it’s intuitive to take up the task of exploring exactly who, or what, Link the avatar is in Breath of the Wild. After all, we already know a good amount about the player—we are the player, after all—and we’ve seen that direct information about the Sheikah Slate and fast-travel is limited. Link is the one remaining variable in our puzzles of fast travel, the Sheikah Slate, the player, and the avatar. It’s time to take a closer look at what we know about him. I want to convince you that the solution to our two puzzles is a radical idea that contradicts one of the explicit statements affirmed by various characters within Breath of the Wild: I contend that the Link who lived and died 100 years before Breath of the Wild’s events wasn’t actually resurrected by the Shrine of Resurrection. Rather, the Shrine of Resurrection created a mechanical copy of Link that can be “piloted” by the player in much the same way as the Divine Beasts of the game are piloted by their respective Champions. I’ll argue that this analysis not only solves the two puzzles discussed above, but also does a better job of holistically analyzing the technology of the Sheikah and accounting for the dynamics of the 18 Link-memories you can acquire over the course of the game. I’ll then reply to objections that (1) this analysis contradicts the very game it proposes to analyze and (2) the analysis doesn’t have enough explanatory clout to be preferable to the more intuitive view that Link really was resurrected. This will lead us naturally to this view’s broader implications for understanding Breath of the Wild’s method of open-world storytelling. The first thing to notice here is that the Shrine of Resurrection is something of a non sequitur in the suite of Sheikah technology: it’s not a weapon like the Guardians and Divine Beasts, nor is it a guidance/training catalyst like the Shrines and Towers. It’s not obvious why the Sheikah would even build such a healing device to operate on people, given that they had already developed a fully automated army and a team of four super-machines. More to the point, it’s the only piece of Sheikah technology that apparently operates on organic matter: instead of simply being an advanced piece of machinery, this machinery promises to manipulate the vitality of organisms. Of course, none of this is a knock-down argument that the Shrine of Resurrection couldn’t possibly do what it purports to do: the point is just that the supposed functionality of the Shine of Resurrection is somewhat dissonant with the rest of the Sheikah technology presented in the game. So it’s worth at least exploring whether an alternative analysis might provide a more unified picture of Sheikah technology—especially if such an analysis also turns out to shed additional explanatory light on the rest of Breath of the Wild’s story and world. Here’s such an alternative analysis: imagine that instead of healing someone by putting them in a “long-term stasis,” the Shrine of Resurrection “resurrects” people by generating a mechanical copy of them: an “android” of sorts that mimics their body without capturing the contents of their mind or soul (we know that things like souls exist in the game’s world from the discussion of many characters). The copy could mimic the deceased person’s mind by having their memories uploaded onto them in some way; it could be trained as a hero through the Shrines across the world; and, crucially, it could be controlled by a pilot like a Divine Beast. This, I propose, is the best available analysis for the real nature of the avatar that the Shrine of Resurrection created: the avatar is not Link, but rather a mechanical copy of him that the player of the game “pilots.” While this view might initially seem radically unmotivated, it actually has distinctive theoretical benefits. In particular, it casts the Sheikah’s technological program in a new, coherently logical light; it also makes new sense of how the avatar’s identity evolves in accordance with the player’s actions over the course of the game. Here’s a problem with the story of the Sheikah: if we take Breath of the Wild at face value, then we’re forced to accept that the Sheikah both had incredible foresight and terrible foresight. On the one hand, they were advanced enough to anticipate the return of Calamity Ganon and devise an intricate system of autonomous machines, pilot-driven machines, and a network of Shrines and Towers to combat this return. On the other hand, they somehow failed to anticipate that Calamity Ganon would be able to take control of both their autonomous and pilot-driven machine armies. How are we supposed to reconcile the Sheikah’s technological mastery with this glaring design flaw in their program? My favored solution is that the Sheikah actually did anticipate the risk of Calamity Ganon wresting control of their machines from them. On my view, the Shrine of Resurrection was designed to combat this specific threat. The logic of the Sheikah, as I see it, is the following. What’s the easiest sort of army to mass-manufacture? An army of autonomous machines (the Guardians). What do you do if your enemy can possess those machines? Build machines with human pilots as a failsafe (the Divine Beasts). And what if your enemy can kill those pilots, possessing these new machines just as easily as the old ones? Build a machine controlled by a pilot who is beyond the reach of your enemy. Here’s where some console theory comes in. The idea is that the Switch is a representation in the player’s world of the Sheikah Slate in the avatar’s world, linking the avatar to the player in such a way that the player can control the avatar in the same way that the Champions control the Divine Beasts. In effect, this metaphysical correspondence between the Sheikah Slate and the Switch allows the player to control the avatar while remaining in a discrete world from the avatar’s—a world that is safe from Calamity Ganon. Ganon obviously cannot kill you, the player, and thus the avatar is safe from the danger of being controlled by Ganon like the Guardians and Divine Beasts were. How outlandish is the idea that the relationship between Switch and Sheikah Slate allows the player, within the fiction of the game, to control a Link-automaton? Not especially. First, notice that interdimensional travel and communication isn’t a foreign concept in the Zelda series more broadly: for instance, A Link Between Worlds centrally features the traversing of dimensional barriers between Hyrule and Lorule, and various iterations of the series’ time-travel mechanics (e.g., the cross-temporal communication in Ocarina of Time’s Spirit Temple) come theoretically quite close to communication between dimensions of some sort of another. Even the concept of one sentient being possessing another humanoid being is familiar to the series: recall Ganondorf’s possession of Zelda in Twilight Princess, or the recurring mechanic of Link controlling statues. Moreover, one of the few analyses of the Sheikah Slate that the game gives us invites this kind of analysis. According to Zelda’s research notes, the Slate can produce “Perfect likenesses of the things you point it at.” The most obvious meaning behind this comment is that the Sheikah Slate can photograph the world around Link; however, the language also suggests that the Slate is able to represent reality while also controlling reality through corresponding Sheikah technologies like Guidance Stones (also discussed in Zelda’s notes). It doesn’t seem like a stretch that the Switch, which already corresponds to the Sheikah Slate in physical appearance, and its ability to be carried throughout the world, could also, within the game’s fiction, represent and exert control over a reality: and in this regard, Zelda’s research on the Sheikah Slate gives us an in-game explanation for the functionality of the Switch. The Switch acts as a Sheikah artifact that represents to the player the reality of Hyrule, and, through its metaphysical correspondence with the Sheikah Slate, bridges the gap between Hyrule’s dimension and the player’s dimension, allowing the player to pilot the Link-automaton through its reality. Notice that this analysis easily explains the two puzzles we considered in the previous section. If the avatar of Breath of the Wild is itself a piece of Sheikah technology, then it makes sense that it could be decomposed and reconstituted across the broader network of Sheikah warp points—we don’t need to invoke anything like faster-than-light transportation of a unique human in order to understand this phenomenon. And of course, based on this analysis, the Sheikah Slate has a very narratively significant bearing on the relationship between player and avatar. 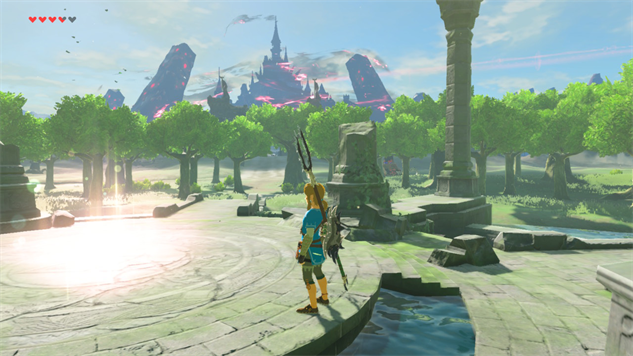 In fact, this analysis has the added benefit of explaining why the Sheikah Slate is central to reactivating all of the Shrines and Towers at the beginning of the game: These locations are designed, according to Zelda, “to train the hero who is fated to combat the Calamity.” When the player arrives at the beginning of the game, the fated hero also arrives—because you, the player, are that fated hero. So the system of mechanical avatar, Sheikah Slate, Shrines, runes, and Towers all activate in response to the player picking up the Switch and activating the Sheikah’s last failsafe. This analysis thus provides us with the unifying understanding of Sheikah technology that the intuitive, face-value understanding of the game lacks. Subsequently, we also get an improved understanding of the avatar’s acquisition of memories over the course of the game. To see this, first notice another puzzle with the face-value analysis of Breath of the Wild’s story: if the avatar is really just a revived Link with memory loss, then why is it that his memory can only be retrieved in discrete chunks at extremely precise locations throughout the world? No doubt, it might be the case that a specific location could plausibly jog an amnesiac’s memory; but one would suppose that, once memories started returning, the memories would cascade, emerging and filling in gaps in the amnesiac’s overall identity and mental repository at an increasing rate. The story of the avatar regaining memories doesn’t work this way: the player can find at most 18, discrete memories of Link’s, and they are all capable of being accessed only by the avatar observing a specific location. If the avatar is really supposed to be Link, then it’s mysterious why he ends up with only 18 memories and can only derive memories from specific locations; buying into this interpretation of the story means we essentially have to throw up our hands here and say that the game admits of no further explanation. On the other hand, the analysis of the avatar as an automaton emulating Link naturally invites an explanation about the dynamics of memory acquisition: we know that the Sheikah Slate (and other technology like the Towers, for that matter) is capable of recording and representing data from the physical world around it; it’s a modest extension of this notion to suppose that the Sheikah Slate could record the experiences of its owner and associate these recorded experiences with the physical locations where they took place. In fact, this method of representing content in physical space is strongly analogous to the Slate’s ability to represent columns of colored light at various points in the world as location markers (or “pins”) throughout the player’s journey. On this view, the Sheikah Slate, while in Link’s possession 100 years before the game, recorded 18 of his central memories, associating them with the locations where they happened. When the Sheikah Slate was implemented to create a copy of Link, it also made it possible for this copy to acquire those 18 memories by traveling to those locations. This explains why the game memories are all tied to specific physical spaces, as well as why the memories are discretely acquired without triggering a cascade of further memory recall (i.e. the cascade we would expect if the avatar were an amnesia-ridden Link). I’ve argued thus far that the analysis of Breath of the Wild’s avatar as a mechanical copy of Link unifies the purpose of Sheikah technology, explains the game’s fast-travel mechanic, illuminates the relation between the player, avatar, Sheikah Slate, and Switch, and accommodates the memory acquisition method uniquely well. But is this enough to make the analysis plausible? 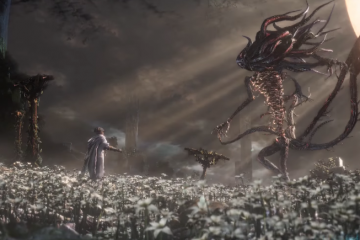 You might have two objections in particular: maybe you’re worried about an analysis that rejects the game’s explicit statement that Link was, in fact, resurrected; or, maybe you’re worried that the intuitive value of the view that Link was resurrected simply trumps the explanatory virtues of the analysis I’ve outlined here. Neither of these objections, I think, should deter us for long. Zelda games, more than most games, are often heavily analyzed through the lens of “canon”: the official, Nintendo-licensed interpretation of how the series’ titles fit together into a coherent set of timelines. This canon mentality, I think, makes some people reticent to doubt any of the explicit information about the Zelda universe provided by the games. Nintendo’s words, and the words they encode in their games, are often taken as law in one way or another. There’s of course value in theorizing about the Zelda canon—for example, hypothesizing about how Breath of the Wild fits into the Zelda timelines—but it’s dangerous to focus on canon to the exclusion of all other analytical methods. A common, established storytelling device is unreliable narration: stories in which a narrator or various aspects of the story’s representation are dubious within the overall ecosystem of the story and its world. This is how The Sound and the Fury works; this is how Fight Club works; this, I’ve argued, is how Majora’s Mask works. To focus only on the letter of canon and on the information a game literally endorses is to ignore the nuances of a story’s overall world: oftentimes, making sense of a game’s universe requires reinterpreting various data from the game’s story in order to gain a maximally coherent understanding of the overall work of art. So I don’t take the objection that my analysis contradicts the game’s claims about Link’s resurrection as a compelling counterargument. Of course, we should be able to offer an explanation of why the game suggests Link really was resurrected, if he in fact wasn’t resurrected. 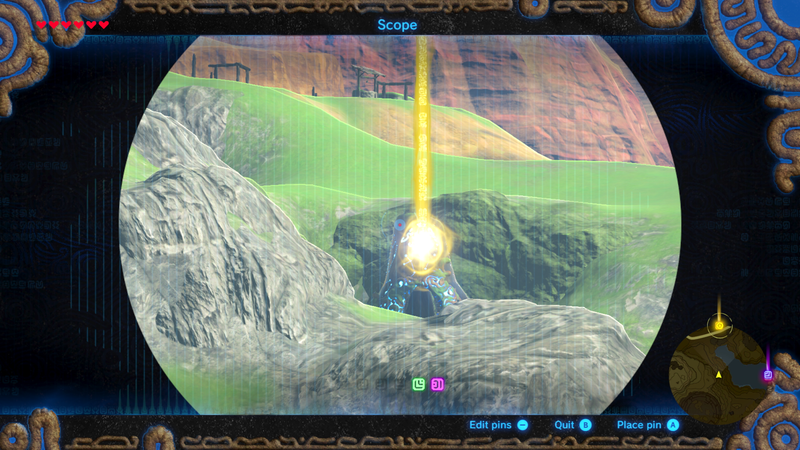 As I see it, there are two possible explanations: either no one in the age of Breath of the Wild was able to uncover the real nature of the Shrine of Resurrection, and so researchers like Zelda and Ms. Purah mistakenly believe that the Shrine resurrects people instead of creating pilotable, machine copies of them; or, researchers like Zelda and Ms. Purah did discover the true nature of the Shrine of Resurrection, and are willfully deceiving the player and avatar about it. My view is that the former of these explanations is the most plausible: presumably the efficacy of a machine replica of a human would be severely hindered if the machine and those around it didn’t genuinely believe that the machine really was the person of whom it was actually a copy. So we do in fact have a plausible explanation of why the beliefs of the characters in the game about the Shrine of Resurrection contradict the actual nature of the Shrine: the Sheikah probably intentionally propagated this misinformation in order to ensure the machine replica could operate effectively. But even still, are the explanatory resources furnished by this analysis really sufficient to give up on the notion that the avatar of Breath of the Wild is Link? You might think that any argument that concludes that Link isn’t the avatar in a Zelda game thereby defeats itself. After all, what is a Zelda game if not a game in which the player’s avatar is Link? The point is well taken: it’s hard to make sense of a Zelda game without Link as an avatar. But, in the last section of this piece, I want to show you that this is the most logical, albeit potentially unsatisfying, choice of avatar possible in the overall storytelling of Breath of the Wild: the player’s avatar can become Link, but it doesn’t have to do so.  The avatar is a blank slate that can evolve in myriad ways. Finally, when we understand how the avatar’s status as a machine imitation of Link allows players to choose whether or not the avatar becomes Link, we will understand in a new and robust way how Breath of the Wild weaves its story and character development into a vast, diverse, open world. This, as I promised at the outset, will shed light both on why people like the game, and on why people don’t like the game. As the player accesses the various Link-memories strewn across the world, she gains more access to Link’s history, and the machine avatar comes to more closely emulate the mind and personhood of Link. The result is that, if the player takes the time to acquire all 18 of Link’s memories, she really feel as if her avatar has come into being the Link she knows and expects from other games: the memories have made the once-blank avatar a more compelling copy of the hero of legend. It’s telling, in this regard, that the last line of the game’s initial ending is Zelda asking the avatar, following the defeat of Ganon, “Do you really remember me?” The scene fades to black without the avatar giving a definitive answer; it is only once the player has acquired all 18 memories that a subsequent ending sequence will play, which shows Zelda and the avatar working together—like Zelda and Link once did in the memories—in a post-Ganon Hyrule. This reinforces the idea that the avatar only really becomes a full copy of Link, capable of recognizing Zelda, upon accessing all of the Link-memories left for him throughout Hyrule. But of course, the player can spend uncountably many hours journeying through Hyrule without acquiring any of these memories, and without pursuing the game’s “main quest” to save Zelda and defeat Calamity Ganon. And from our analysis, it follows that a player who does this—exploring Hyrule without pursuing the main quest—thereby controls an avatar that is not Link in any way but his physical appearance. Why does this matter? Surprisingly, this unusual use of a mechanical avatar ends up circumventing a central problem of modern video-game storytelling in open worlds. Games these days are increasingly focused on open worlds: environments with a huge number of potential paths and adventures that the player can explore in any order, with little regard to how far the player has advanced in the game’s primary storyline (i.e. the one that consists of the game’s central events and typically ends with the credits). This strategy seems like a promising way to afford players more choice and a more dynamic sense of exploration in the game’s world, but it can bring deep problems for storytelling—especially where tales of destiny are concerned. Consider as an example Final Fantasy XV. 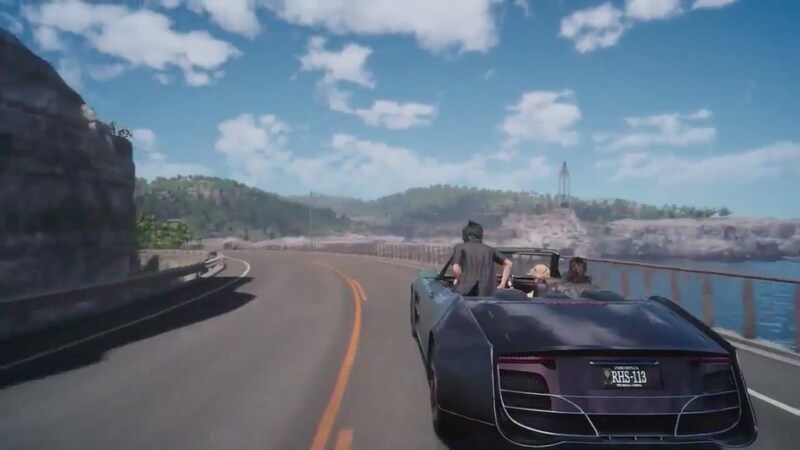 The game is at once about a prince (Noctis) who goes on a destined quest to save the world, and also about that prince going on a roadtrip-adventure with his three closest friends. The open world of the game brings about a challenging tension between these two central themes: in particular, every moment that Noctis and his friends adventure around the world completing sidequests is a moment in which Noctis is shirking his duty and putting off saving the world. A similar problem exists in games like Skyrim, but it’s particularly apparent in Final Fantasy XV because the alternatives to the main quest of heroism are often mere leisure activities like driving in a convertible, fishing, hiking, camping, and hunting—activities that it’s hard to believe could ever justly take precedence over saving the world. The mechanical identity of Breath of the Wild’s avatar allows the game to solve this problem of open-world storytelling in an unexpected, surprisingly simple way. So long as the player is focusing on sidequests and not collecting Link’s memories, the avatar remains nothing more than a physical copy of Link’s body; thus it stands to reason that the avatar is not under the same obligation as the hero Link to undergo the hero’s quest and defeat Ganon. It is only once the player begins aggregating Link’s memories, thereby molding the avatar’s identity into that of Link, that the avatar becomes correspondingly obligated to save Hyrule from Ganon. Because the avatar’s identity evolves with the choices of the player to pursue or avoid the main quest, the avatar is not automatically blameworthy for avoiding the main quest in the way that Prince Noctis or the Dragonborn would be. As I said, these dynamics of the avatar’s identity explain why the game is both likable and unlikable. To the first point, the player is free to explore Hyrule with impunity because their avatar is under no intrinsic obligation to save the world in the way that Link would be. But to the second point, notice how radical a departure this is from the typical (but not ubiquitous) Zelda formula: the series is renowned for giving the player control of a chosen hero who must fulfill his destiny by saving the world from evil. To be given control of an automaton for which saving the world is optional therefore has the potential to be deeply unsettling in the broader context of the series: the freedom to explore, so deeply enmeshed in the ethos of the game, cuts against the grain of good-against-evil destiny: it invites the player to take her avatar and cook food instead of combatting Ganon. With all the Sheikah technology permeating Breath of the Wild’s world, maybe it shouldn’t be so surprising after all that the avatar is a piece of Sheikah technology as well. By analyzing the game in this way, not only do we glean a stronger understanding of their technological program and of the player’s relationship to the game, but we also gain a new theoretical basis for the exploratory freedom central to Breath of the Wild’s method of storytelling. The story may distance players from the real Link, but it only does so in order to give them a new kind of choice: a choice to make their avatar the kind of person who is bound by destiny, or to decline that mantle of destiny altogether. Wow. A very in-depth and thought-provoking analysis. I’d not even considered the idea that we’re steering a machine. It does explain a few things (like the teleportation). I guess that’s Breath of the Wild’s final big reward, or idea – the game is so open that you can interpret even the very notion of the character in a whole new way – and as every choice is in fact, one made by the player, the player gets to feel as though they somehow become worthy of being the champion who will save Hyrule. An interesting subplot to your idea, is that Link tends to be reincarnated (one of the memories even references this). If we’re controlling a mechanical avatar, does that mean the Link we know and love is going to reappear one day, stunned (and perhaps dismayed) to find a robot version of himself running around? Thanks for reading, darthtimon—glad you enjoyed it. Really interesting idea of a real incarnation of Link confronting the mechanical copy. There’s certainly precedent for confrontations like that in the series: Link and Dark Link; Link and the Hero’s Shade; Link and Ravio. And I think you’re right that an analysis like this is a payoff for the openness of Breath of the Wild; the lesson, I think, is that open world games had better have an open, dynamically evolving protagonist if they’re going to succeed at telling a compelling story. So, where does Breath of the Wild stand on the Zelda charts for you? For me, it’s number one now – used to be A Link to the Past (ah, SNES memories), but BOTW is in a whole new league.